If your troop is using TroopWebHost to manage fundraiser sales, you may be authorized to enter your orders directly into the system. If you are authorized for this function, you will see My Fundraiser Sales on the My Stuff menu. 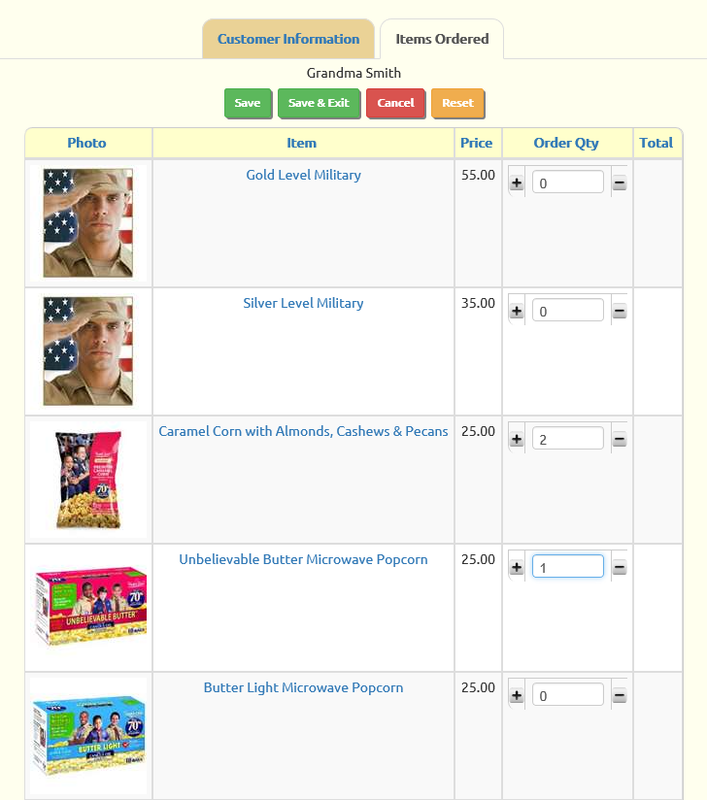 This page allows you to enter and review orders that you've received for troop fundraisers, like the annual popcorn sales. It begins by showing you a list of the orders you've already entered into the system. 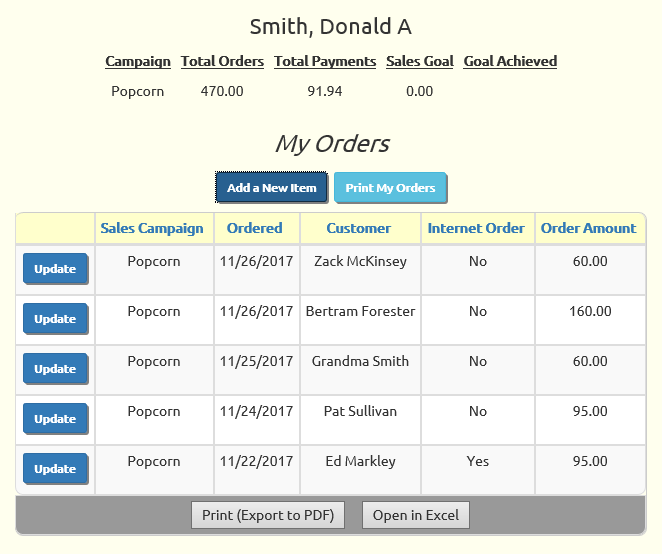 Click Print My Orders to print a delivery report that shows the details of each order on a separate page. Click Add a New Item to begin entering a new order. Begin by selecting the Sales Campaign this order is associated with. Often there will only be once choice on this list, which will be the current fundraiser. Then enter the date of this order. This defaults to the current date, which is always a good choice. You must enter the Customer Name so you know who this order should be delivered to. The Address, E-Mail, and Phone fields are all optional, but they will help you remember where to deliver the order and how to contact this customer. Do not select a choice from the Paid By list unless you've actually received payment from this customer for this order. Click the Continue button to proceed to the next screen where you will select the items that were ordered. This page shows a list of all of the items available for this sales campaign. Type the quantity ordered into the Order Qty box for each item, or use the Plus (+) and Minus (-) buttons to increase or decrease the quantity. Click Save to save this order and see the extended totals. Click the Customer Information tab to review the rest of the information on this order and see the total amount for the order. Click Save & Exit to return to the list of all of your orders.